Combine all the ingredients and mix until there are no clumps. Fill cupcake tins 2/3 full and bake at 350 degrees F for 15-18 mins. Stir sugar and water over medium-low heat until the sugar completely dissolves (meaning no grains at all.) Turn to high and bring to a boil without stirring. Use a wet brush to keep the mixture from crystallizing on the edges of the pan. Continue to boil until syrup turns a deep amber color (5-6 mins.) Remove from heat and whisk in the heavy cream. After completely combined, add in the butter and salt. Transfer to other dish and allow to cool. With the paddle attachment, cream the butter and caramel until well combined. Slowly add the powdered sugar until it’s well combined. Add the cream one tablespoon at a time until the frosting is lighter. Note: this frosting isn’t very stiff, so just be forewarned when you go to frost. 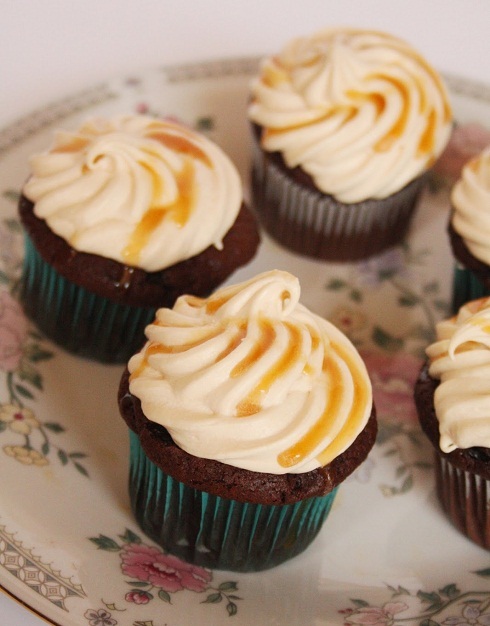 Frost your cupcakes using the remaining 1/2 batch of caramel to drizzle over the top. I also sprinkled a little kosher salt over my cupcakes for a little more of the salty taste!